My wife and I decided to take a short hike on New Year’s Eve, another bluebird day in Tahoe. We checked out all of our usual places and found the trailhead’s packed with cars. The Tahoe Rim Trail at Brockway Summit, Martis Dam Road, Martis Valley, and the 5 Lakes trailhead all way too busy for our liking. The 5 Lakes trail is a great hike that passes some alpine lakes and connects with the Pacific Crest Trail. This trail is typically closed this time of year due to avalanche danger and lack of parking. We were amazed to find this trailhead also packed with cars. There must have been 50 cars lining both sides of the street. In the summertime when I see 10 cars, I consider the trail crowded. We decided to hike on the Western States Tail from Squaw Valley Park, off Squaw Valley Road at Hwy. 89. This isn’t a long hike, but it’s a steep grade to the top. The hike follows a Northern slope so it’s in the shade. There isn’t much snow to cross, but it’s hard and slippery. 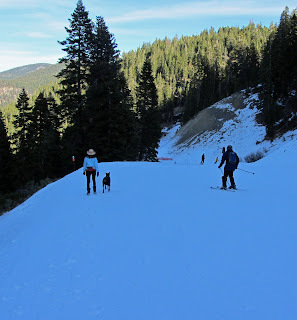 We got to the ridge and decided to take a new route down that we hoped would come down near the Resort at Squaw Creek. As we descended we began to encounter more and more hard-packed snow. It was slow going. Eventually we came to the ski run that returns skiers to Squaw Creek. We ended up walking nearly a half mile along the edge of the ski run to get off the mountain. Our short hike turned into a 4 hour slip and slide which included several slip and falls plus my unintended slide down an ice slope. Everybody is out enjoying the hiking right now, but stick to trails with a southern exposure and bring more food and water than you think you’ll need. The good news is we had the trail to ourselves, we only saw one other person out there. Walking our dog with skiers. If you want to hike or bike up the Tahoe Rim Trail to Martis Peak, the trail is still in great shape and free of snow. A weekday would be less crowded. If we ever get any snow it will be less crowded yet!